and about the Tennessee Workplace Charging Partnership! Drive Electric Tennessee is a collaboration between stakeholder organizations working together to drive the Tennessee Valley to become an electric transportation leader in the Southeast. For the past several months, a core team of organizations including Tennessee State agencies, electric utilities, cities, universities, electric vehicle OEMs, and others have been working together on a shared vision, goals, and guiding principles for Drive Electric Tennessee. We are now beginning to develop a roadmap that will help achieve our vision and goals over the next 5-10 years, and invite you to participate in the roadmap development process. Your input is critical to the success of Drive Electric Tennessee as we form partnerships and plan projects, with many opportunities for you to get involved. Keep checking back for more information and event details. If you are interested in joining us, please contact DriveElectricTN@navigant.com. What is the “TN Workplace Charging Partnership”? What is Workplace Charging? 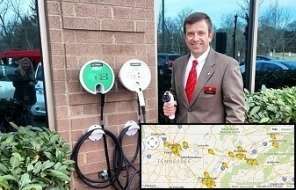 The process of adding EV charging stations at businesses so that employees can charge their vehicles at work! This increases the driving distance that any EV can drive after work. What is this Partnership? The “Tennessee Workplace Charging Partnership” (TWCP) is a new cooperative of nonprofits, state agencies and industry partners that are helping Tennessee businesses learn about and place EV charging equipment onsite! Homeowners looking into electric vehicles (EVs) often decide that they need a charging station at home. The rare few that are familiar with performing their own electrical work and with securing the necessary permits may want to self-install a hard-wired or portable charging station. However, before installing an electric charging station at home, please carefully consider your current skill level and speak with a local electrician. Why Install EVSE at my business? Learn more about how the Workplace Charging Partnership works, and visit with one of our existing partners, Oak Ridge National Laboratories. Watch the video below, read the 6 Steps to Workplace Charging, then contact us with any questions. Join the Partnership! Click here for the one-page agreement that clarifies what you need to do. Just review and then we can help you make your company greener for your employees and Tennessee!